This Cert Guide provides more in-depth information about all of the RHCSA and RHCE topics that are covered in the video courses, including 4 RHCSA practice exams and 4 RHCE practice exams. First step in becoming a Red Hat Certified Engineer (RHCE) is becoming a Red Hat Certified System Administrator (RHCSA). 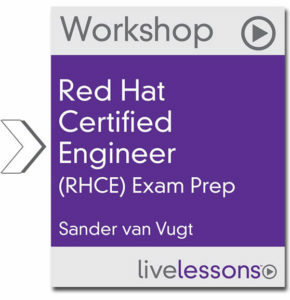 Before working as a Red Hat Certified Engineer or taking the RHCE exam you should have passed the RHCSA Exam. Preferably you have gained some experience in working in a Linux environment. 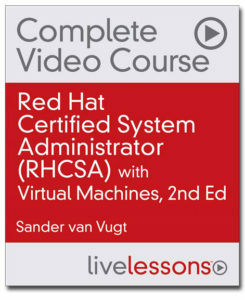 This RHCSA course helps you to gain an in-depth understanding of all topics on the RHCSA exam, as well a deeper understanding of Red Hat Enterprise Linux so you master the key foundation principles of systems administration. You will learn using comprehensive video training which includes whiteboard concept teaching, live CLI work, screen cast teaching, and hands-on labs. Also you will practice with included virtual machines. and prepare yourself for the RHCE exam by learning about the key concepts for all the objectives on the RHCE exam. 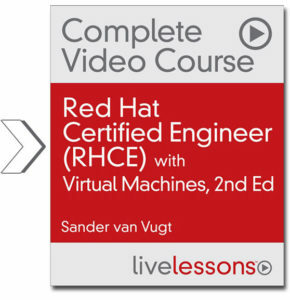 With this course you will gain an in-depth understanding of all topics on the Red Hat Certified Engineer (RHCE) exam, as well as a deeper understanding of Red Hat Enterprise Linux. You will learn using comprehensive video training (13 hours) which includes whiteboard concept teaching, live CLI work, screen cast teaching, and hands-on labs. Also, you will also be able to get a real-world experience by working with the included virtual machines and test your understanding of the concepts and develop your skills. Get ready in the week before taking the exam by experiencing a test exam walk-through, receiving exam tips and learning from FAQ’s. This video course covers the key concepts to avoid traps, pitfalls and difficulties on the RHCE Exam. You will experience what it is like to do the test in a live practice exam test walk-through with the author. Having insight in the structure of the exam, what to do when you’re stuck, how to approach questions and track time, and benefiting from other exam tips will increase your chances of passing your exam at your first try. 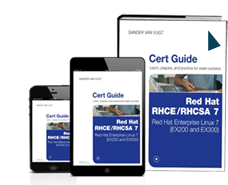 This Cert Guide provides more in-depth information about all of the RHCE and RHCSA topics that are covered in the video courses, including 4 RHCE practice exams and 4 RHCSA practice exams.